Last updatit on: June 24, 2013. 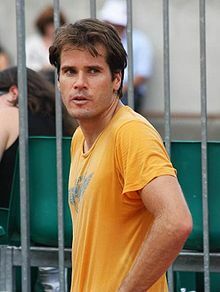 Thomas Mario "Tommy" Haas (born 3 Aprile 1978) is a German professional tennis player. He haes competit on the ATP Tour syne 1996. Efter breakin intae the warld tap 100 in 1997, an reachin a career-heich singles rankin o Warld No. 2 in Mey 2002, Haas's career wis interruptit bi injuries: he haes twice dropped oot o the warld rankins due tae bein unable tae play for twal months. His first period o injury saw him miss the whole o the 2003 saison, an he did nae return tae the warld's tap 10 till 2007. He an aa missed ower a year's tennis atween Februar 2010 an Juin 2011, but haes syne returned tae play on the tour. He returned tae Warld No. 11 efter reachin the quarterfinals at the French Open for the first time in his career. Altho Haas haes nivir wan a Grand Slam toornament, he haes reached the semifinals o the Australian Open three times, an Wimbledon ance. He is ane o few players tae hae reached the quarterfinal stage o each o the Grand Slams. He haes wan 14 career teetles in singles an doubles, includin ane Masters toornament, an haes a siller medal frae the 2000 Simmer Olympics. ↑ Tommy Haas: Renaissance Man Bleacher Report. 9 June 2011. Accessed 18 October 2011.